Odyssey Control SL Serato & Traktor Scratch Shortcut Keyboard DJParts - All Variety of Parts that DJ Needs. CONTROL SL SERATO BACKLIT KEYBOARD Serato Scratch Live DJ's as well as Tracktor Scratch users are now in total control with Odyssey's New Control SL keyboard controller. Easy to manipulate color coded backlit shortcut keys allow you, the artist, to be creative and have the flexibility to concentrate on what matters the most, the music. 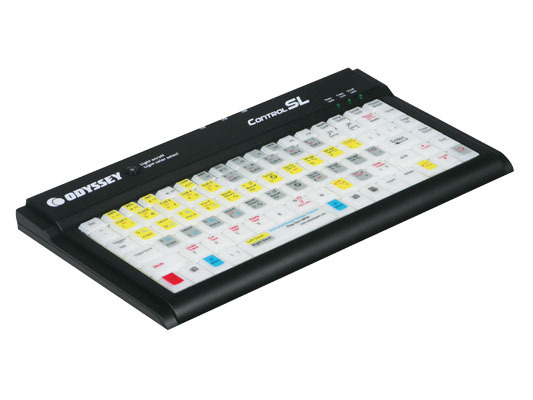 LED backlit keys can keys can be sent to one of the seven colors available or fast scrolling color change mode. Furthermore, there are three additional USB connections in the back allowing you to connect your hard drives or any other USB controlled devices. Wait there is more, it is PC and MAC Compatible. • Cable length is 56"